Local Government Minister Gerry McCarthy today would not rule out that the NT Government will move to compulsory acquisition of the Town Council-owned Anzac Oval as green space for the National Indigenous Art Gallery. He was asked the question four times by the Alice Springs News Online during a “media event” this afternoon. These were the answers Mr McCarthy gave. As the Minister for Local Government would he not have to be on the side of the council rather than on the side of his Cabinet? Philippe Perez, from CAAMA, pointed out Labor MLA for Stuart Scott McConnell had reservations about the gallery being at the Anzac precinct. Mr McCarthy replied that the big question is now where we are going to “house the thousands and thousands of tourists a year”. Mr McCarthy was in town partly to introduce body-worn cameras as standard for public housing safety officers. He said they were useful in “de-escalating conflict incidents” and could be used as court evidence and in police investigations. 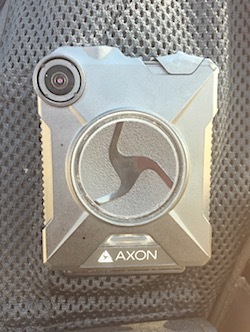 They can be turned off and on at the officer’s discretion and the archive of recordings is “managed essentially by NT police”. The recordings can be subpoenaed. 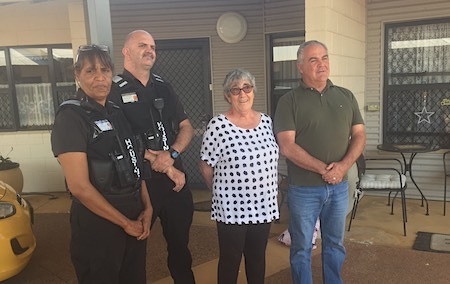 Mr McCarthy is pictured with safety officers Rosina Ross and Leon Spurling (a well-known local musician), and Mary Pritchard, a resident of public housing in Albrecht Drive. An international hotel is needed? Can’t see another hotel being built just to accommodate people coming to see the art gallery. The CLP dreamt about one on the spare land diagonally opposite Harvey Norman and that got nowhere. Projects in Darwin go ahead, not sure and doubt if this or other projects apart from the constant talk will ever occur in the Alice. So what is the need for all this focus? Got to question. Possible compulsory acquisition! Why am I not surprised? No Confidence in the Gunner Government.